Trupanion was founded in 2000 by Darryl Rawlings, the winner of the 2015 EY Entrepreneur of the Year Award. Originally Trupanion operated only in Canada, but after becoming the first profitable pet insurance company in North America, they decided to expand into the United States and insured their first American pet in 2008. Trupanion has continued to use their love of pets to fuel their growth in order to provide quality pet insurance to as many people as possible. Trupanion is ideal for those owners who want a simple plan that has no annual, lifetime or per incident limits on claims. Trupanion only has one main plan that provides the same coverage to every single customer. However the price paid per month depends on breed, dog size, age, gender, whether they are spayed or neutered, the cost of local veterinary care and the price of the deductible. Monthly prices can vary greatly because of this. 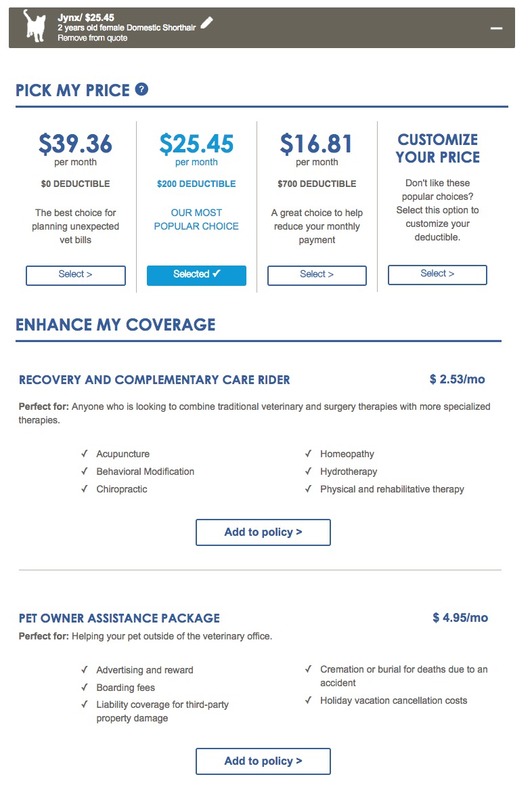 Trupanion also warns that the price of your coverage may increase as your pet gets older or if the cost of veterinary care in your area rises. As an example, to insure a 2 year old medium mixed breed female dog in Minnesota using a deductible of $200 (the most popular option) will cost $39.12/month. Pricing and Plans for a 2 year old female, medium, mixed breed dog from Minnesota. Pricing and Plans for a 2 year old female domestic short haired cat from Minnesota. Trupanion has a 30 day waiting period following enrollment for illnesses and 5 days following enrollment for injuries. Any problems that occur within this time frame are considered pre-existing conditions and will not be covered. Trupanion is available in all 50 states. However, Washington state and Texas have different policies. You can also take your pet to any veterinarian in the U.S, Canada, or Puerto Rico. Trupanion’s list of exclusions includes: examination fees, pre-existing conditions, illness or injury that appear to be from repetitive and specific activity (i.e. bite wounds) that occur 2 times within 18 months of each other, preventative care such as vaccinations, tick/flea control or heartworm medication, dental cleaning, spaying/neutering, and breeding. specific Illness or Injury, this policy will pay out all future losses for that specific Illness or Injury. The lower your deductible is the higher your monthly premium will be, and vice versa. You are free to change the deductible whenever you want. To submit a claim you just have to fill out a simple one page form that can be sent through e-mail or postal mail. According to the sample policy Trupanion provides on their website claims are payable within 60 days after submission of an approved form. Trupanion has only one option for a reimbursement level, which is 90%. There are no per claim, per year, or per lifetime limits. Trupanion covers therapeutic pet foods and dietary supplements. They also offer 3 optional plans for an additional fee. 1. Recovery and Complimentary Care: this plan covers treatment such as rehabilitative therapy, acupuncture, and chiropractic for $4.40/month. 2. Pet Owner Assistance Package: this plan covers boarding fees, burial fees, and liability coverage for $4.95/month. 3. Breeding: this plan covers illnesses or injuries related to breeding. It substantially increases your premiums – for our test quote animal it raised the premium by $24/month. Unfortunately Trupanion does not offer a wellness add-on that covers veterinary exams or vaccinations. This appears to be a major drawback as most of their competitors provide wellness as an optional add-on at least. Trupanion has a 24/7 customer service that can be reached by phone or e-mail. You can call toll-free at 888-733-2685 in the U.S or 855.591.3100 in Canada. They can also be reached online at customercare@trupanion.com for any further inquiries. Customers should be warned that Trupanion took much longer to respond to an e-mail inquiry than other insurance agencies. This experience has been supported on other pet insurance sites. Pricing is determined by whether your pet is spayed or neutered, the breed, the size(dogs) age, gender, the local cost of veterinary care, and the deductible. Just for Trupanion's main plan without any add-ons owners should expect to pay around $39/month for dogs and $25/month for cats. *Sample price based on a 2 year old female medium mixed breed dog from Minnesota or a 2 year old female domestic short-haired cat from Minnesta with a $200 deductible and 90% reimbursement level. Pets from 8 weeks to 14 years can enroll with Trupanion. Routine wellness care such as vet check-ups and vaccinations are not covered. Trupanion is designed to mainly cover accidents and illness. There is no optional wellness add-on. Deductibles range anywhere from $0-$1000 for any particular illness or accident. Your premium will never change due to the number of claims that you file or the amount of payments you receive. Only cats and dogs are covered under Trupanion. There are no annual, lifetime or per visit limits with Trupanion. Dental care for accidents and injuries only – no routine dental cleaning is covered. Heredity and congenital conditions as well as hip dysplasia are also covered as long as they are not pre-existing conditions. Trupanion is best suited for pet owners who want the freedom to choose their deductible amount and the guarantee that no matter the cost of treatment 90% of the price will be covered. The three add-on plans provides services like breeding, rehabilitative therapy, and liability coverage. While many other insurance companies limit the amount you can receive on a yearly, per visit, or lifetime basis Trupanion guarantees that they will cover 90% of the bill no matter the cost. This is perfect for any owner worried about the expenses associated with an unforeseen accident or illness. Even though hip dysplasia and congenital conditions are very common ailments many competing pet insurance companies do not cover them. Trupanion insures both these problems as part of their core plan as long as they are not pre-existing conditions. Claims approved by Trupanion will be reimbursed within 60 days of submission. This is much longer than many of their competitors who offer a maximum of 2 weeks for reimbursement. Variables that are completely out of your control such as the average cost of vet care in your area influence the monthly premium you are charged. Most pet owners would prefer a predictable price that changes as little as possible. Even though Trupanion offers 3 extra add-ons, they do not offer one for wellness. Many pet owners want coverage for vet checks and vaccinations as well, and it is unfortunate that they do not provide and option for this. Trupanion is a great pet insurance for owners who want guaranteed coverage if their pet ever has to undergo expensive treatment or surgery. Their offer of no annual or lifetime limits and a reimbursement level of 90% is one of the most appealing in the industry. However you will pay more for that coverage. 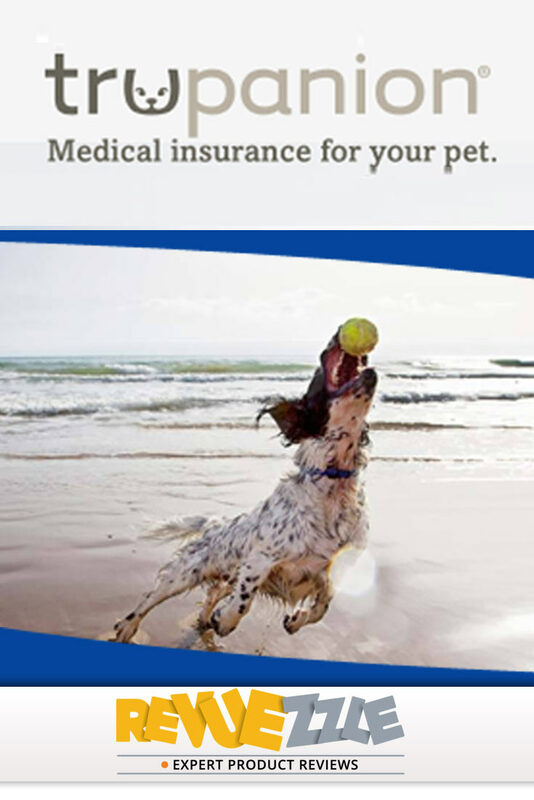 As well, they offer optional coverage for breeding which most pet insurance companies do not offer. Despite all of this, their customer service record is not the best even though they offer 24/7 support, and they take much longer to reimburse costs than most of their competitors. Even with these shortcomings you can take comfort in the fact that Trupanion will support you if your pet ever requires expensive care, which is really the most important thing that pet insurance can provide. Ideal for owners that want guaranteed 90% coverage with no annual, lifetime or per visit limits. 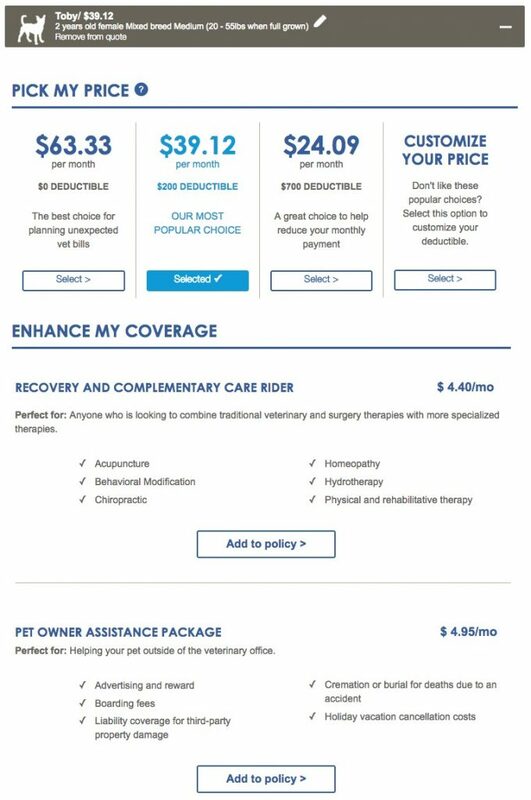 Pricing is determined by, breed, age, gender, zip code, the deductible you choose, and whether your pet is spayed or neutered. *Sample price based on a 2 year old female medium mixed breed dog or 2 year old female domestic shorthair cat from Minnesota with a $200 deductible and 90% reimbursement level. $25.00 Get Your Quote Today! You can choose your own deductible from $0 to $1,000 with Trupanion!